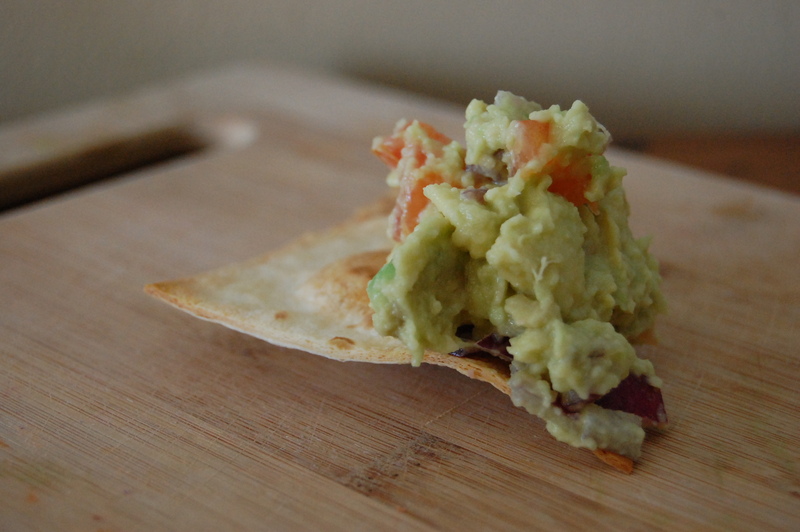 Simple Guacamole and Baked Lime Tortilla Chips for 2! Avocados are definitely enjoying some well deserved celebrity at the moment. I gather they are a little sick of being chased down by the paparazzi, but when you choose to be a super food… well, that’s a topic for another post. In any case, this is a recipe you can find all over the internet, but I decided to share it because I do use guacamole in quite a few recipes. It makes sense to throw it into a post for you guys. The majority of recipes for making baked tortilla chips call for corn tortillas. I happened to have flour burrito tortillas at home, so I decided to see what would happen. They came out a little more like pita chips than tortilla chips, so give it a shot and tell me what you think. I stacked the tortillas and used a pizza wheel to slice them. Because they were burrito size, I ended up shaving a bit off the ends to make them a reasonable size. I don’t know anyone who likes to wrestle a monster chip through a bowl of guacamole. If I’m making guacamole as a condiment, I chop everything very finely and smash it all very smooth. When I’m making it to serve as a stand alone dish, I pay a little more attention to appearance. 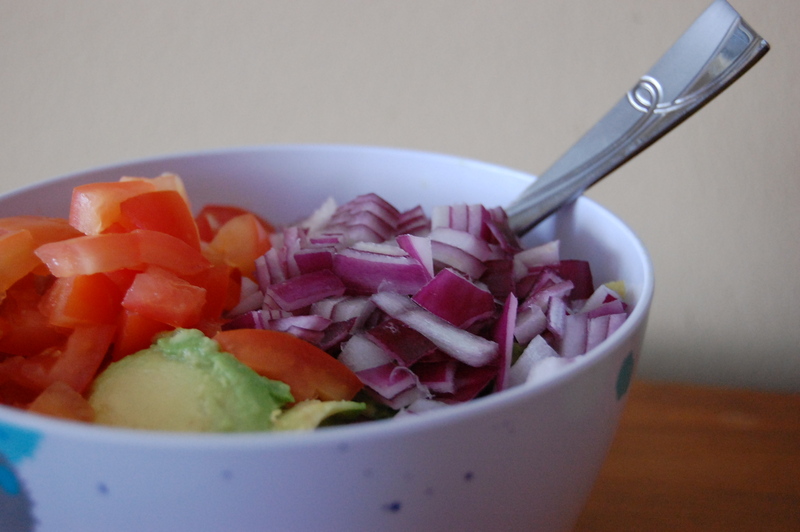 Using a red onion instead of white is my go-to “pretty guacamole” tip, and leaving the whole dish a little “chunkier” is (in my opinion, at least) way more attractive. Agree or no? I have a theory that eating enough super foods will give me super powers. My fingers are crossed for invisibility. I’ll let you guys know how it goes. 1. Slice avocados lengthwise and twist until the halves come apart. Remove and discard the pits. 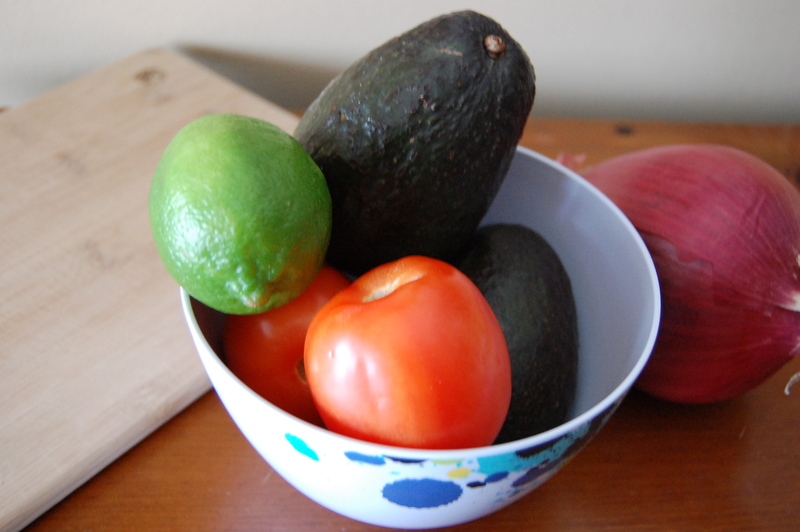 Scoop avocado out of shell and into mixing bowl. Slice tomatoes lengthwise and use a spoon to remove and discard seeds and pulp. Dice tomatoes and onion and add to mixing bowl. 2. Squeeze the juice from 1 lime over the contents of the mixing bowl. 3. 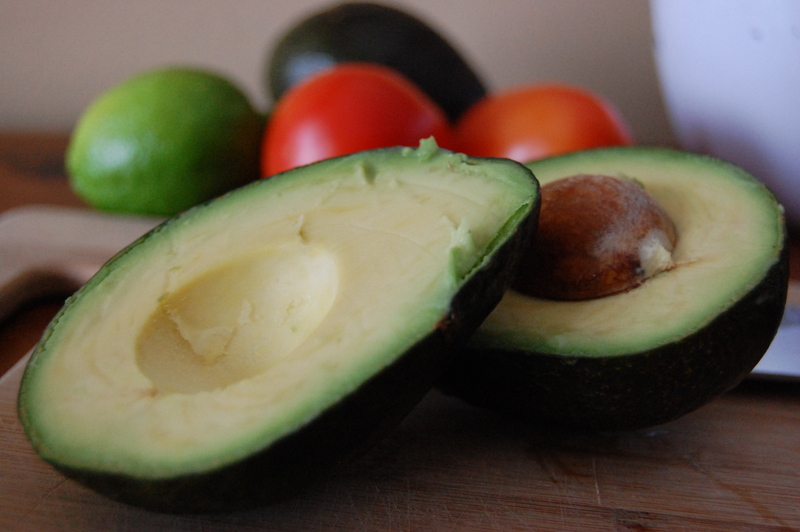 Using a fork, stir and mash the contents of the bowl until the avocado is broken down to the desired consistency. Serve. 2. Squeeze juice from 1 lime into small bowl and add salt. Mix well. 3. Using a pastry brush or silicone basting brush, coat the tortilla chips with lime juice mixture and allow to dry. Repeat if desired. 4. Stack tortillas and using a pizza wheel, slice to desired size. 5. 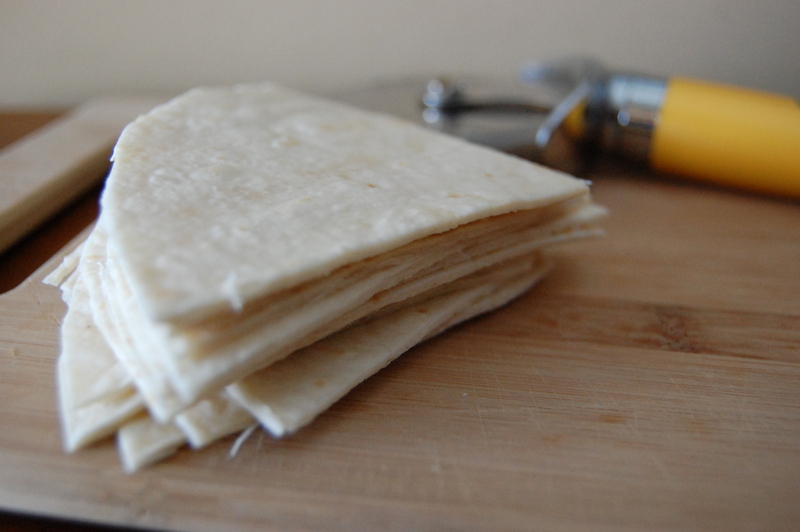 Place tortilla pieces in a single layer on baking sheet and bake for 5 – 7 minutes. Turn chips over and bake an additional 5 – 7 minutes until crisp. Serve. 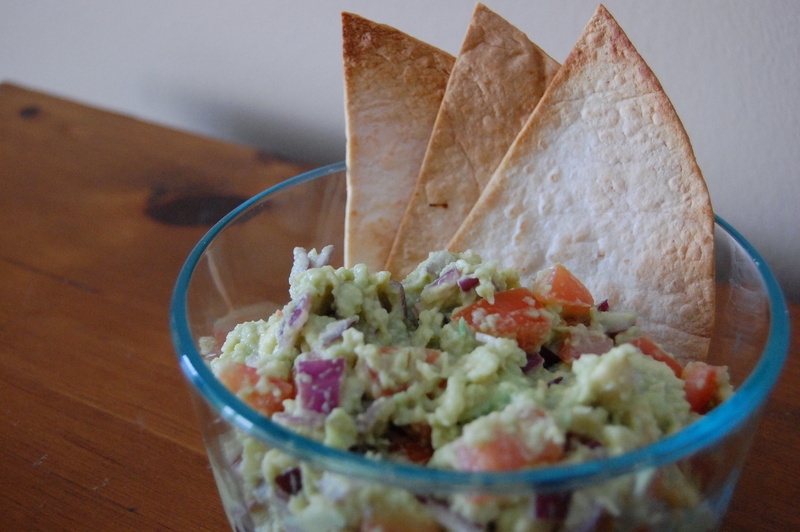 This entry was posted in Appetizers, Snack, Vegetarian and tagged Appetizer, Avocado, Cooking, Easy, Guacamole, Mexican, Recipe, Snack, Super Food by Lazy Suzan. Bookmark the permalink. I’m totally trying these chips! Next time I’m going to try making them with corn tortillas! Great-looking recipe. I have to try these chips. Are the ones you make with flour as crunchy as the corn ones? I love a good guacamole. But you MUST try it with finely-chopped cilantro. The flour ones are slightly less crunchy than corn and a little more flaky (in a crisp way, if that’s possible). And yes, my standard guac has cilantro and jalapenos in it! 🙂 Thanks for stopping by!